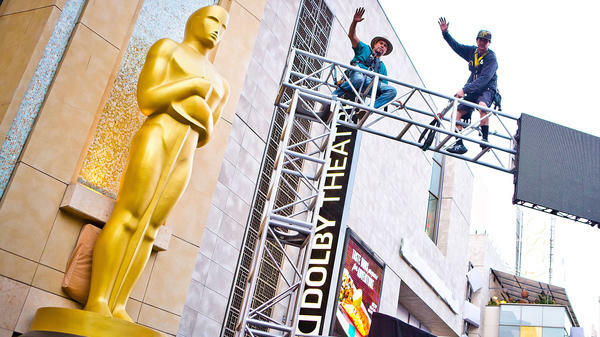 Preparations continue for the 87th Annual Academy Awards at the Hollywood & Highland Center in Hollywood, CA. On Sunday night, we'll be where lots of other people will be: on Twitter. NPR film critic Bob Mondello will be tweeting alongside me and my Pop Culture Happy Hour collaborators Glen Weldon and Stephen Thompson, and you can follow all of us — me, Bob, Stephen and Glen — or the hashtag #NPROscars. This is also a good time for non-Oscar people to mute not just our hashtag, but also #Oscars in general, as it will help you not see the avalanche. And it's also a good time for a reminder that hashtagging event-related tweets is good Twitter etiquette. But! We will not be silent. We will be babbling away about the red carpet beginning sometime in the early evening Eastern time (E! red carpet coverage starts at 5:30 Eastern), and we will be all over the ceremony, beginning at 8:30. We hope to see you.